You can get picky about which podcast episodes — and even which parts of audio books — should be copied to your iPod during synchronization. When syncing an iPod touch that already has Apple’s iBooks app installed, you can also choose which electronic books to sync and use with iBooks. 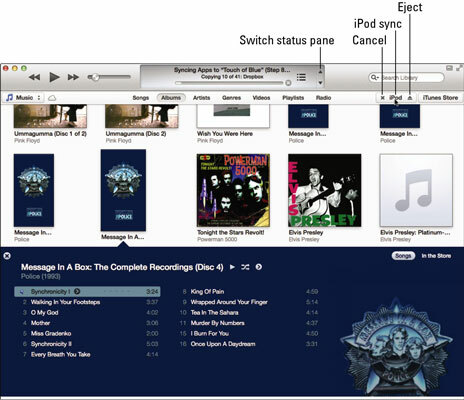 Connect your iPod to your computer, and click the iPod button. Then click the Podcasts tab of the sync pages. The Podcasts sync page appears. Click the Sync Podcasts option at the top. The Podcast sync options let you choose unplayed or recently added episodes. Select the Automatically Include ____ Episodes Of ____ check box; choose a modifier from the first pop-up menu, such as All Unplayed or 3 Most Recent; and then choose All Podcasts or Selected Podcasts from the second pop-up menu. If you chose Selected Podcasts, you can select a podcast in the Podcasts column below these options, and then select specific episodes in the Episodes column (which may already be selected, depending on your choices in the pop-up menus). For example, in the illustration, the three most recent episodes of selected podcasts are automatically synchronized. This syncs the three most recent episodes of those two podcasts. 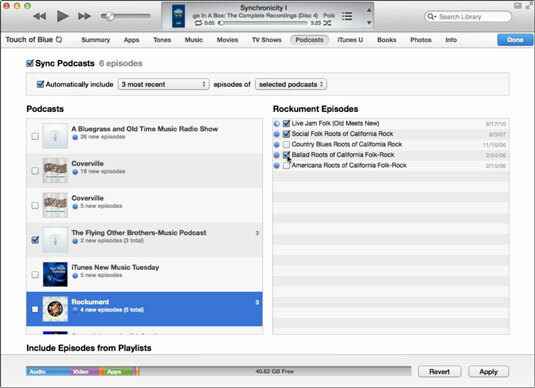 There is also manually selected one more episode of the Rockument podcast. When you’re set, click the Apply button to apply changes. Connect your iPod to your computer and click the iPod button. The Books sync options page appears. You can sync e-books and audio books. Choose All Books to sync all of them. Choose Selected Books, and then select the books you want to sync, or deselect the books you don’t want to sync. You can sort the list of books by title, author, or date in the Sort pop-up menu within the Books section, and select either Only Books (e-books designed for the iBooks app), Only PDF Files (documents in the Portable Document Format that can be viewed in iBooks), or Books and PDF Files. Choose All Audiobooks to sync all of them. Choose Selected Audiobooks, and then choose entire audio books in the Audiobooks column on the left or select an audio book on the left and then choose specific parts of the audio book in the right column. After choosing sync options, click Apply to apply changes, and then click Done to finish changing sync options and start syncing. After syncing podcast episodes, audio books, or e-books, you can continue listening or reading from where you left off on your computer or other synchronized device. For example, if you were reading an e-book using the iBooks app on an iPod touch, synced the iPod touch with iTunes, and then synced your iPad with iTunes, you can continue reading with the iBooks app on your iPad from where you left off on the iPod touch.